[http:// www. electricalzone. 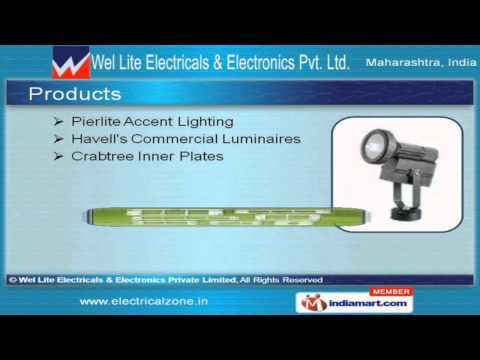 ]Welcome to Wel Lite Electricals & Electronics Pvt. Ltd. Distributor & Trader of Electrical & Electronic ProductsAn ISO certified company, Incepted 2008, at Mumbai. Our State-of-the-art frastructure &trusted vendor base help us to cater East Asia, Middle East, South East Asia & other countries. We are backed by skilled workforce, transparent busess deals, strgent quality analysis & ontime delivery. We offer a vast range of Crabtree Inner Plates, Pierlite Accent Lightg & Havells CommercialLumaires. Crabtree Front Plates, Hensel Junction Boxes & TRENDnet Surveillance Cameras are alsooffered by us. We also provide Walther Insulated Plug Sockets & Hensel KV Products at cost effective prices. Crabtree Surface Mountg Plastic Boxes, Flash Street & Industrial Lightgâs are widelyappreciated the market. Our Hensel M. I. Box, Crabtree Power Units & Flush Metal Boxes are well known for theirfunctionality. Along with that we offer Crabtree Foot Light, Pierlite & Flash Commercial Lightgs. For more formation, log on at -http:// www. electricalzone.